. : One Sky Now - Organic Produce :. Our organic produce is available starting in mid May. 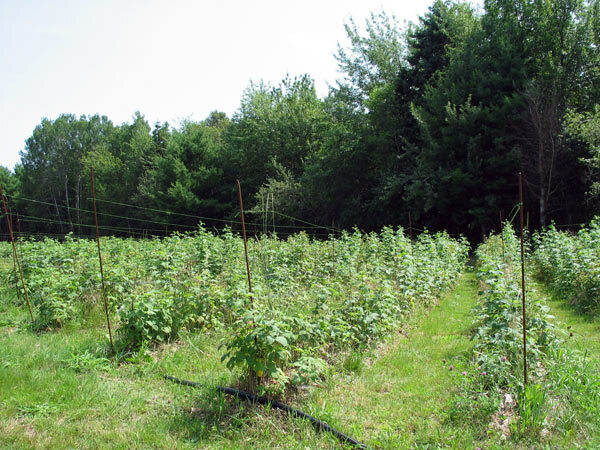 We have fresh asparagus, raspberries, blueberries, and table grapes mid-September to early October. Perennials and bushes are available from mid-May to September. The seaweed mulch apparently does more than just discourage weeds. "The old-timers around here always claimed that the seaweed made the asparagus sweet," Gail says. "And they were right. I've never tasted asparagus as good as this." We use all appropriate organic techniques. The asparagus, raspberries and propagated plants are all mulched with eel grass and seaweed to keep the weeds down. Berries are usually available to be picked between June and July. Asparagus is available from the last week in May and lasts about 3 weeks.